Houston added speed, athleticism, and length to their defensive secondary with the selection of KJ Dillon. Although his Mountaineer teammate, and Raiders first-round pick, Karl Joseph received most of the attention at West Virginia, Dillon proved that he too was a safety to keep an eye on. Dillon possesses good cover skills for a safety and should be able to cover tight ends downfield. He is scheme versatile and can play in either a zone or man-to-man base system. He displays awareness and good closing speed in zone coverage, and is able to quickly close in on anything thrown in front of him. Dillion came on strong in his final two seasons in Morgantown combining for 111 tackles, 14 tackles for loss, four interceptions, and 14 passes defensed. Improving in his anticipation and ability to make a play on the ball. Dillon will need to get stronger in order to be better equipped to compete at the point-of-contact, when defending the run, and will also need to shore up his tackling ability if he wants to see regular snaps on defense for the Texans. However, with his coverage skills and athleticism, Dillon is an intriguing prospect who has a chance to develop into a quality starter for Houston down the road. The Colts made it clear to their players and their fans that they were not happy with the amount of punishment quarterback Andrew Luck had been receiving in the last couple of seasons. So they set out to rebuild their offensive line using the draft to help replenish the talent level, and drafted four offensive linemen which is something they had never done before in team history. Blythe is another in the long line of well-coached, intelligent Kirk Ferentz offensive lineman. A four-year starter, and former wrestler who won three state titles Blythe was a team captain for the Hawkeyes, and has started multiple games at each interior offensive line position. Besides being smart, and versatile Blythe was also a durable performer for Iowa as he finished out his collegiate career making 45 straight starts. Blythe has terrific feet and initial quickness at the snap of the ball. He is able to set up quickly in pass protection and will plant his hands inside the chest of the defensive lineman. What I love most about Blythe is that he plays the game hard and with some nastiness as he is always looking to finish off his blocks. 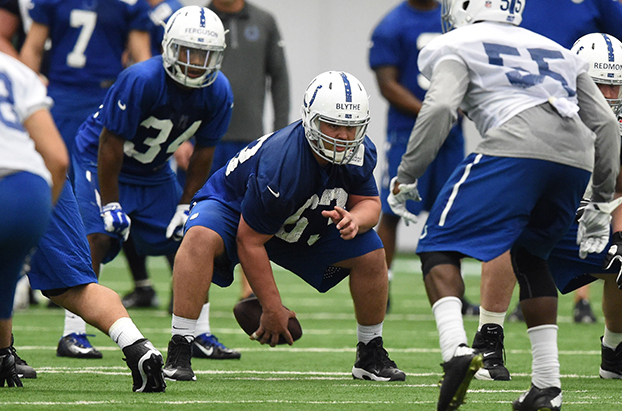 At the recent Colts rookie minicamp Blythe saw extensive action lined up at guard next to first-round pick Ryan Kelly. Initially, look for Blythe to make the team as a backup interior lineman, but if given the opportunity to start he will make it very difficult for the coaches to put him back on the bench. Looking to improve on their 29th ranked pass defense and increase the overall team sack numbers (36) from last season General Manager Dave Caldwell and head coach Gus Bradley loaded up on pass rushers and defensive playmakers in the 2016 draft. With Tyrone Holmes they have an undersized college defensive end who they will convert to outside linebacker. Holmes, who was the FCS Defensive Player of the Year in 2015, put together a sensational final season at Montana finishing with 21.5 tackles for loss, 18 sacks, and three forced fumbles. Holmes can supply speed off the edge with a quick-twitched first step, and long strides. He displays good lateral agility and can chase plays down the line of scrimmage. At Montana’s pro day he ran a 4.58 forty, with a 1.65 10-yard split, and demonstrated some lower body explosiveness with a 37.5 vertical jump. At only 6’2” and 253 pounds Holmes is not stout at the point-of-contact which is why Jacksonville will convert him to outside linebacker, and has him learning the LEO position which is a hybrid defensive end/linebacker position. The Jaguars will initially look to use Holmes as a situational pass rusher off the edge in hopes of taking advantage of his speed and quickness to help generate more pressure on opposing quarterbacks. The Titans are continuing to add playmakers to their offensive unit in order to help surround Marcus Mariotta with enough weapons to be successful. With Sharpe they added a smooth athlete who was a four-year starter at UMass. Sharpe led the nation in receptions last season, with 111, playing in Mark Whipple’s pro-style system. Sharpe was a first team All-MAC selection in 2015 and finished his collegiate career 277 receptions, 3,386 yards, and 16 touchdowns. Sharpe is a good route runner who can get in and out of his cuts quickly. He has soft hands and is able to hold on to the ball through contact. While not a speed demon Sharpe is quick enough to get by defenders and has decent build-up speed to get open downfield. Sharpe, who has impressed the Titans coaching staff so far this offseason, was running with the first team offense in the recently completed Titans minicamp. Look for Sharpe to compete with fellow receivers Justin Hunter and Tre McBride for a spot on Tennessee’s 53-man roster.